Representations allow you to customize the appearance of features by storing symbol information with the feature geometry inside feature classes. This additional control can help you meet stringent cartographic specifications or simply improve the display. Representations are a property of a feature class that are stored in system tables inside the geodatabase and in the feature class itself. A feature class can have more than one representation associated with it, allowing the same data to be displayed uniquely on different map products. You create and manage representations by accessing the properties of a feature class in the Catalog window or in ArcCatalog. You can also create a representation on a feature class by converting a symbolized feature layer. The two images below show a simple example of how representations can improve the display of feature geometry for cartography. Compare the line features drawn with conventional symbology to those drawn with representation symbology. The red circles highlight areas where representation symbology has drawn line connections unambiguously. Representations can also be used to customize the display of individual features within a feature class. Individual feature customizations are called overrides. For example, line features can be symbolized with a dashed-stroke representation rule. Then, properties of that rule, such as the stroke weight or color, can be overridden for individual features without changing the structure of that rule. Representations are a property of a feature class; they can be created and managed from ArcCatalog or the Catalog window in ArcMap and with representation management geoprocessing tools. They can also be created directly from symbolized layers in ArcMap. Representations consist of a collection of representation rules to define how each category of feature should be displayed. The Representations toolbar contains tools to edit the appearance of individual feature representations. The simplest way to create a representation on a feature class is to convert a symbolized layer. A layer contains symbol information applied to source features that can be converted into representation information. 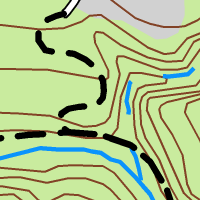 When the representation is created, the symbol information from the layer is converted to representation symbology and stored with the feature geometry in the geodatabase. Representation rules are created and automatically applied to features. Alternatively, representations can be created directly on a feature class in ArcCatalog or from the Catalog window in ArcMap. This is a useful approach when establishing a schema and cartographic specification prior to data availability. In this case, rules will be created but not applied to features. You assign rules to features while editing in ArcMap or with the Calculate Representation Rule geoprocessing tool. Representations can also be created using the Add Representation geoprocessing tool. 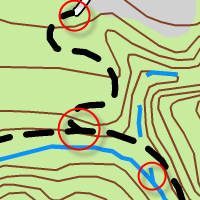 When a feature class has a representation, you can use it to draw its features in a layer in ArcMap. When you add the feature class to a map, it will be drawn with the representation by default. (If there is more than one representation on the feature class, the first one will be used.) The appearance of whole categories of features can be modified by adjusting the properties of the representation rules contained within the representation. A representation rule contains symbol layers and geometric effects to define how a group of related features in a representation is drawn. Representation rules can be stored within styles for sharing and reuse in other representations. Symbol layers are the basic building blocks of the representation rule and can be one of three types: marker, line, or fill. A representation rule must have at least one symbol layer but may have many to support complex depictions. Geometric effects are optional components of representation rules. They alter the geometry of features dynamically at draw time to achieve the desired appearance without affecting the associated shape of the feature itself. This means that a complex view of the data can be achieved without affecting existing spatial relationships. Geometric effects can apply to just one symbol layer or globally to all symbol layers in a representation rule. Geometric effects work sequentially, so the dynamic result of one becomes the input for the next. Representation rules include symbol layers and can include geometric effects. The components of the symbol layers and the geometric effects in a representation rule collectively make up the representation properties of that representation rule. Representation property values can be the same for every feature that follows the rule, or they can be read from fields in the feature class. 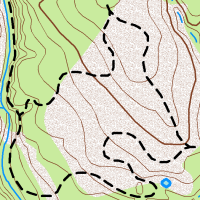 In some cases, cartographic refinement geoprocessing tools can be used to populate these fields with meaningful values. When a layer is drawn with a representation, features are drawn according to the properties of their assigned representation rules. In some cases, it may be necessary to customize the appearance of a few features slightly differently from the way the rule depicts them. In this case, an exception to the representation rule properties can be made for individual features. These changes are stored and maintained in the geodatabase as property overrides and will appear on any map that references that representation. Overrides can be modified or removed to return the feature representation to the default depiction of the representation rule. Optionally, geometry can also be overridden using representations. 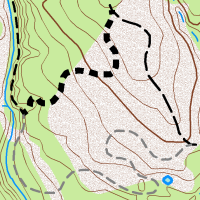 Geometry overrides allow you to modify the appearance of feature geometry on your maps without affecting the geometry source features, which you may be using for analysis or processing. These are persistent edits, different from the dynamic geometry changes that occur at draw time with geometric effects. A set of representation editing tools is provided on the Representation toolbar specifically for making these types of modifications. Geometry overrides are sometimes called shape overrides. In extreme cases where a feature requires a unique or complex rendering, its representation can be converted into a free representation, which gives you full artistic control over its appearance. A free representation has its own representation rule not associated with any other feature. Therefore, you change the properties of the representation rule, and you can also change its structure. This means that you can add new symbol layers and new geometry types to this single feature. For example, you can draw a polygon to be associated with a line feature. The definition of the polygon’s shape and size would exist wholly within the line feature’s stored symbology. It would not affect the Shape field of the line. Free representations should only be used when standard representation symbology and overrides are insufficient, as they will begin to affect draw performance if they are used excessively. Also, you will lose much of the automated benefit of representations when you move to the manual control allowed by free representations. Geoprocessing in ArcGIS is a framework where automated operations are managed to derive new data from geographic database or to enrich existing geographic information. Individual geoprocessing tools can be run as single operations or put in logical sequences in models and scripts to perform comprehensive GIS and mapping tasks. Within this framework, cartographic geoprocessing tools are designed to automate cartographic tasks, which are historically manual and time-consuming. As part of an overall map production workflow, geoprocessing tools exist to modify representation symbology and manage representations on feature classes. 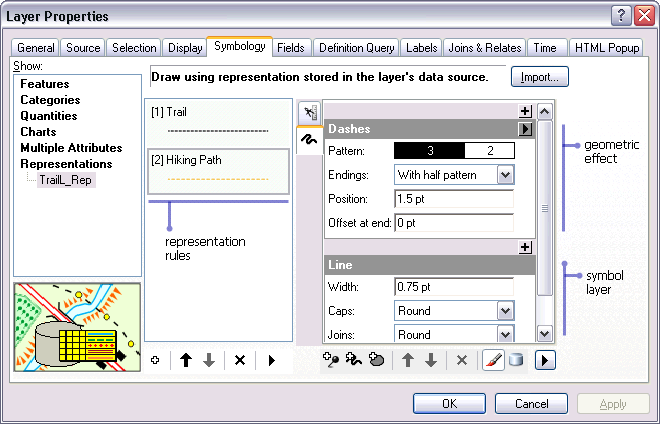 The geoprocessing tools related to representations are found in the Cartography toolbox.